Decorative plates on walls were often hung on sprung claw hangers. 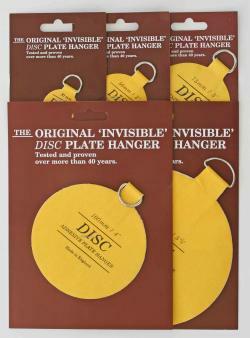 Over the years it has been proved that these actually stress the plate & cause damage to what could be a valuable item. 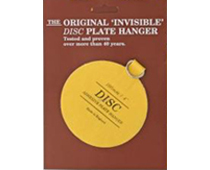 The disc plate hanger is very secure & removable, without damaging the plate. Simply wet the hanger & fix it to the back of the plate ­ then leave it to dry completely. To remove the hanger ­ soak the plate in warm water. Instructions are included. Top Tip ­ plate hangers are a great way of hanging unframed artwork on board. Glue the hanger to the back of the board with contact adhesive & it allows you to fix your artwork almost flush to a wall.